Pretty much EVERY time I install vRA Version 7. * I always get an error relating to the vRA IAAS Service. It stops Endpoint Compute Services from being displayed, stops data collection of all added endpoints and generally makes vRA a paperweight. The error can be found under Infrastructure>Monioring, you’ll know you have issues if you have hundreds\thousands of the same error! The error is related to the MS DTC service, if your Windows SQL Server and Windows IAAS Manager Servers have been rolled out from the same vSphere template then you will likely get the error, I read a large number of blogs that say this only happens if Sysprep hasn’t been run, however I see this issue whether SYSPREP is run or not. The GUID of MS DTC doesn’t seem to change and the duplicate GUID entries of the SQL & IAAS Manager Server results in the issue. Uninstalling\Re-Installing\Re-Configuring MS DTC seems to be the most appropriate resolution to this issue, I run the following commands on all IAAS Manager Servers and SQL Servers. I then restart The SQL, IAAS MAnager & vRA Appliance for good measure. The following can be used to remove a CDROM drive from a powered on Virtual Machine using vRO, vRealize Orchestrator. Rejoice details on the VCIX 6 exams for Data Centre Virtualization & Cloud have finally been released! I’d originally held off sitting the VCAP-DCD 5 exam back in Feb 2015 (im already a VCAP-DCA holder) as the VCIX 6 exams were supposedly imminent, that wait is finally over and study can begin in earnest. Exam registration is expected early to mid-January with first beta appointments in late January. However, questions still remain on the prerequisites for the VCIX/VCAP6 exams. or whether they first need to sit and pass the VCP6 exam. 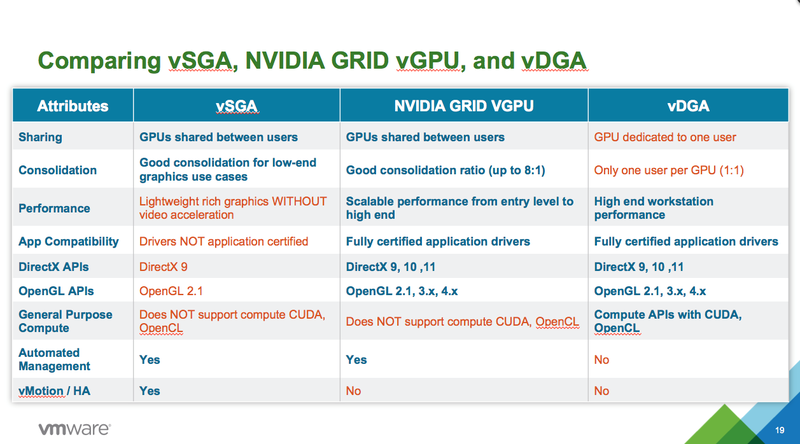 VMware Horizon 6.1 now supports NVIDIA GRID vGPU for their virtual desktop users, but before jumping on the rich graphic bandwagon there are some considerations to be made, for instance NVIDIA GRID VGPU doesnt support vMotion or HA because of the direct-path access to the hardware. Before using the hardware-based (GPU) virtual Shared Graphics Acceleration (vSGA) feature in vSphere, you must install and configure the NVIDIA GPU VIB (vSphere Installation Bundle) on ESXi. I’m sure there will be some use cases for GRID, but I’d imagine the lack of vMotion & HA support will be a deal breaker for most. I hope you enjoy it & I hope you find stuff here useful!